HIT: Director Sophie Hunter and actor Benedict Cumberbatch were hands down the best dressed couple on the night. Bradley Cooper and Clint Eastwood (R) pose for a selfie with Oscars made of lego bricks after the end of the 87th Oscars February 22, 2015 in Hollywood, California. 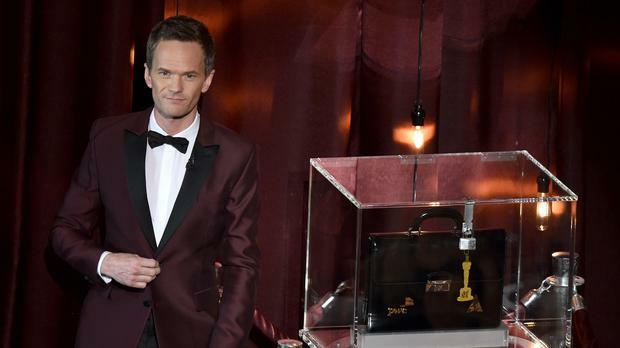 It was the first time Neil Patrick Harris (aka Barney from How I Met Your Mother or the creepy ex-boyfriend from Gone Girl) has presented the Oscars and the full verdict is yet to come in on whether he was better than James Franco or as eyebrow-raising as Seth MacFarlane. The immediate consensus is that the comic actor was pretty cringe-worthy. Here are some of the best and worst jokes of the 87th Academy Awards – not going by who laughed in the audience (hey, they were always going to be uptight about diversity jibes). "Tonight we honour Hollywood’s best and whitest – sorry, brightest." On Benedict Cumberbatch: "It's not only the most awesome name in show business, it's also the sound you get when you ask John Travolta to pronounce 'Ben Affleck’." "Welcome to the Oscars, or as I like to think of it, the Dependent Spirit Awards." "Our next presenter [Dakota Johnson] is not only the star of the record breaker for biggest February premiere ever, 50 Shades of Grey, she's also the reason you had to explain to your grandmother what a spanking bench is." "In Zero Dark Thirty [Kathryn Bigelow] helped kill Osama Bin Laden. In A Million Ways to Die in the West I pooped in a hat." "Robert Duvall, every five minutes, please wake up Octavia Spencer if she gets sleepy. Eddie Redmayne, every five minutes, please wake up Robert Duvall." "The eight Best Picture nominees brought in over $600 million, and American Sniper is responsible for $300 million of that. Put it to you this way: this half of the theatre are the other seven nominees: American Sniper is Oprah [looks directly at Oprah]. Because you’re rich." "There it is, American Sniper with Bradley Cooper. The most prolific sniper in history, with over 160 confirmed kills. Or, as Harvey Weinstein calls it, a slow morning." "Every nominee is getting a gift bag tonight. It contains make-up, shoes and an armoured car ride to safety when the revolution comes." "He’s the real deal, pants down. I mean hands down. Channing Tatum!" "Tonight is also for the people who love these movies, who bought a ticket, who took a ride, who got lost in the stories that inspire us, the stories that motivate us, that remind us to be brave in the face of danger, to chase impossible dreams and to stand up for our rights. Tonight, on this stage, we have come together to celebrate and hopefully to fall in love with moving pictures all over again. OK, maybe not Smurfs 2."